This practical guide on conducting power analyses using IBM SPSS was written for students and researchers with limited quantitative backgrounds. Readers will appreciate the coverage of topics that are not well described in competing books such as estimating effect sizes, power analyses for complex designs, detailed coverage of popular multiple regression and multi-factor ANOVA approaches, and power for multiple comparisons and simple effects. Practical issues such as how to increase power without increasing sample size, how to report findings, how to derive effect size expectations, and how to support null hypotheses, are also addressed. Unlike other texts, this book focuses on the statistical and methodological aspects of the analyses. Performing analyses using software applications rather than via complex hand calculations is demonstrated throughout. Ready-to-use IBM SPSS syntax for conducting analyses are included to perform calculations and power analyses at http://www.psypress.com/applied-power-analysis . Detailed annotations for each syntax protocol review the minor modifications necessary for researchers to adapt the syntax to their own analyses. As such, the text reviews both power analysis techniques and provides tools for conducting analyses. Numerous examples enhance accessibility by demonstrating specific issues that must be addressed at all stages of the power analysis and providing detailed interpretations of IBM SPSS output. Several examples address techniques for estimation of power and hand calculations as well. Chapter summaries and key statistics sections also aid in understanding the material. Chapter 1 reviews significance testing and introduces power. Chapters 2 through 9 cover power analysis strategies for a variety of common designs. Precision analysis for confidence intervals around mean difference, correlations, and effect sizes is the focus of chapter 10. The book concludes with a review of how to report power analyses, a review of freeware and commercial software for power analyses, and how to increase power without increasing sample size. Chapters focusing on simpler analyses such as t-tests present detailed formulae and calculation examples. Chapters focusing on more complex topics such as mixed model ANOVA/MANOVA present primarily computer-based analyses. 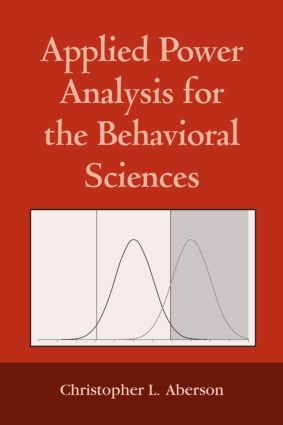 Intended as a supplementary text for graduate-level research methods, experimental design, quasi-experimental methods, psychometrics, statistics, and/or advanced/multivariate statistics taught in the behavioral, social, biological, and medical sciences, researchers in these fields also appreciate this book’s practical emphasis. A prerequisite of introductory statistics is recommended. WHAT IS POWER? WHY IS POWER IMPORTANT?